It is safe and easy to remove eyelash extensions yourself in the comfort of your own home. They are attached to your natural lashes with semi-permanent glue, making the removal of eyelash extensions a delicate but easy-to-follow process. We are going to learn how to remove eyelash extensions without damaging your natural lashes or, more importantly, your eyes in this post. Extensions will last for several weeks, but after that you will start to notice that some of the lashes are breaking or falling out while at the same time, new, natural lashes are growing in. At this point you can either go back and get new ones added, or remove the stragglers yourself. Keep in mind you do not want to pluck the false lash as this unsafe method can damage your natural lash and is not recommended. You should see the false lashes come off on the cotton ball, or notice them dropping off. If lash extensions are stubborn and you have difficulty removing them all, go back to the professional who applied them to help with removal. Eyelash extensions enhance the appearance of the length, volume, and thickness of your natural lashes for good looking eyes. They are fun to flaunt and the application process is easy to understand. Lash extensions will follow your lashes’ natural growth cycle, which is around 30 to 45 days, and will often shed with the natural lash. Taking good care for your lashes will ensure they last the projected time. Avoid wetting your eyelashes for 24 hours after going in for eyelash extensions. It is not recommended to wear mascara, and you really shouldn’t have to. But if you feel like you need an extra boost of volume, you can use oil-free mascara on the tips once they grow out a bit. Do not use anything oil-based, including cleansers, hydrators, or makeup removers, as this will break down the adhesive quicker. It is best to sleep on your backif at all possible so that your face doesn’t hit the pillow and absolutely do not wear an eye mask. Anything pressing on your lashes can irritate them or point them in the wrong direction. Don’t pull, pluck, twist, or fuss with the extensions. Never use an eyelash curler. Eyelash extensions are not exactly a low-maintenance affair, but they create some serious glamour. If you fall in love with your extensions and want to keep them, it is best to go back for touch-ups within three to four weeks rather than removing them and starting all over again. But if it is just a spontaneous one-time thing, you can learn how to remove the extensions at home. Whether you have elected synthetic or mink eyelash extension, they are all short lived. Usually, they are temporary until your natural lashes fall out, those lush and glamorous extensions will typically endure for a period of two months. Unfortunately, there comes a period where some of the extensions fall out, but, not all of them, and certainly not all at once. They don’t all just fall off all of them but they shed naturally as your natural lashes depart. As such, your first method of lash deployment should be to have them professionally removed. The applying salon will have the proper chemicals to bust through the used eyelash adhesive and get them off your eyelids without damage to your existing lashes. But, there are some people who still wonder how to remove eyelash extensions safely on their own without the help of a professional. Again, this is not the recommended method, and you should strongly consider not doing it in this way. However, if you insist on finding out how to remove eyelash extensions on your own at home, then you can start with the steam and natural eyelash adhesive remover method. Remember, there is no right way to do this without professional help, so remove safely and gently. Everything has to be clean. The mascara for eyelash extensions that you generously applied this morning on your mink lashes has got to be removed. Use a gentle makeup remove and ensure that all of your eye makeup has been properly removed. You will also want to get a good make up mirror. This will allow you to see the ends of your real lashes and where the extensions begin. You will need to carefully examine this and make sure that all of the makeup or any other debris has been removed. There is no really a safe way to make steam, so be careful! Heat water until it is quite hot enough that it will produce steam. You can also use a drugstore-bought facial steamer that you normally use to open up and clean the pores on your face on a weekly basis. Hold your face over the bowl and drape a towel over your head to trap the steam in. Steam can burn, so don’t stick your face directly up to the bowl while trying to figure out how to remove eyelash extensions! Hold it close enough to feel the warm steam, but far enough away so that your skin doesn’t become a casualty. Let your face be steam-in field for about ten minutes. The crucial step in how to remove eyelash extensions safely on your own is to moisten a cotton ball with olive or coconut oil. Being careful to avoid getting any in your eyes, carefully wipe the cotton ball over your eyelashes. Do this gently but repeatedly, until your synthetic or mink extensions begin to fall off. Start by removing the residual oil with a gentle rinse. You can clean thoroughly after this, however starting with a rinse will help to loosen any hanging-by-a-thread extensions that were missed on your multiple passes. Once you are satisfied that all of your extensions have been successfully removed, you can wash your face normally to remove any greasy feeling or remaining oil residue. Note that steaming can be a bit drying to your skin, so don’t forget to moisturize your face after the final clean-up, with a hypoallergenic moisturizer such as by Cliniderm. Eyelashes are adhered to your natural lashes and last for approximately 8 weeks when maintained properly. After an 8 week period, you need to remove eyelash extensions to avoid any unnecessary eye infections or minor irritations that are associated with overuse of the extensions. To remove eyelash extensions can be completely efficient and effective by using a few ingredients you already have lying around your house instead of purchasing pricey removal products. 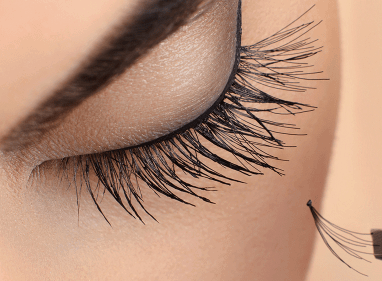 If you have olive oil and Vaseline, you can remove eyelash extensions. Choosing to remove eyelash extensions without the aid of a removal product is a smart decision. Many products on the market contain harmful chemicals, like formaldehyde and parabens which are linked to cancer. Organic products are available but are more expensive than using a simple swab of olive oil or Vaseline. Vaseline also has stripping powers and is water based. While most products used on lash extensions are water proof and non-oil based, once Vaseline is applied to the lashes, just like olive oil, the cementing effects are reversed. 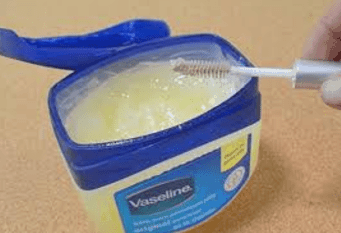 Vaseline has also been known to soften natural lashes like olive oil and even stimulate new lash growth due to essential nutrients and nourishment provided from the cream. If you have ever had eyelash extensions, you have probably wanted to know How to remove eyelash extensions safely in your own home. Coconut oil is good just like olive oil to do this job. Use a gentle makeup remover and ensure that all of your eye makeup has been properly removed. You will also want to get a good make up mirror. This will allow you to see the ends of your real lashes and where the extensions begin. You will need to carefully examine this and make sure that all of the makeup or any other debris has been removed. Using a microwave safe bowl, heat water in the microwave until it is quite hot that is, hot enough that it will produce steam. Coconut oil – this is the important part for removing eyelash extensions moisten a cotton pad with coconut oil. Being careful to avoid getting any in your eyes, carefully wipe the cotton pad over your eyelashes. Do this gently but repeatedly, pulling in coward’s direction until your extensions begins to fall off. If you would prefer to not use steam you can just use the oil but this will take longer so be patient do not yank or pull the lashes as you will pull your own on eye lashes out. Depending on the type of falsies you’re sporting, you may not even be able to fully take them off yourself. What you can do at home, however, is add just a few more steps to your cleansing routine to help rid yourself of temporary strips and stray semi-permanent lashes. For the most natural effect, many women opt for individual lashes, or hairs meticulously glued one at a time to each of their own eyelashes. These lash extensions are waterproof and last a fairly long time if upkeep is consistent. Refills once every two to three weeks keep lash shedding from looking sparse, but if you don’t get the refills done, the extensions will all eventually fall off on their own. In the end, you may be left with just a few stragglers. If you have only a few hairs to take off, you don’t need to go to the salon. Wash your face and use your makeup remover as you normally would to clean away dirt and makeup, and then fill a bowl with steaming water to help soften the adhesive. Cover your head with a towel and lean over the bowl for 15 minutes to get the full effect. Afterward, dip a cotton pad in coconut, olive or baby oil and swipe it gently across your lash line until the extensions loosen and fall away. Cluster lashes and strip lashes are applied with temporary glue, often latex-based, so they are not as waterproof as lash extensions. To remove them, soak a cotton pad in an oil-based makeup remover or coconut, baby or olive oil. Hold the cotton pad over your closed eye for 20 seconds to loosen the glue. Repeat as necessary until the lash strip or clusters loosen enough to lift away without pulling your skin. For extra residue, swipe a cotton swab dipped in oil over your lash line. Lash extensions can be irritating if you’re not used to them, but avoid the urge to rub, pick, pull or twist — this can damage your real lashes. If you still have a full set of semi-permanent lashes and want them removed, give your esthetician a call. Professionals use a special solvent and work to carefully remove each individual hair, which is difficult to do on your own eyes. If you have removed your own lashes, treat your skin well afterward with a gentle cleanser and moisturizer. Artificial eyelash extensions are attached to your natural lashes with semi-permanent glue. You have to be careful when removing them, or you risk pulling out your natural lashes. Remove your eye makeup. Use a gentle eye makeup remover to wipe away any mascara or eyeliner. This makes it easier for you to see where your real lash ends and the extension begins. Heat up a bowl of water in the microwave. Let it get hot enough to produce steam. Hold your face over the bowl and drape a towel over your heat, to trap the steam around your face. Steam your face for about ten minutes. Wet a cotton ball with olive oil. Wipe it on your lashes, taking care not to get any in your eye. Continue gently wiping your lashes with oil until the extensions begin to fall off. Rinse your eyelashes. Splash warm water on your face to wash away excess oil. Buy lash glue remover. If it’s not possible to get back to the salon, try removing your lashes with lash glue remover. You can find lash glue remover at most drugstores. If you had your extensions professionally done, ask the technician which solvent he or she uses, and see if you can just purchase it there. Glue remover is a mild solvent with a smell similar to nail polish remover. Stand in front of a mirror in a well-lit bathroom. If necessary, bring in extra lighting to prevent shadows cast over your face from interfering with your ability to clearly see your lashes. Remove your eye makeup. Use a gentle eye makeup remover to wipe away your mascara and eyeliner. You need to be able to see where your real lashes ends and the extensions begin. Wet a cotton swab with glue remover. Make sure it’s thoroughly damp. Gently pull down the outer corner of one of your upper eyelids. Close one eye, and using the soft pad of your finger, gently angle the eyelid downward at the outer corner. Your upper lashes should be pointing downward, giving you a better view of the extensions. Move the cotton swab across your lash line. Work from the outer corner to inner corner in small, gentle motions. The remover should start to dissolve the glue. Pull out the loosened extensions. After you’ve been over your lash line about 15 times with wet cotton swab, grip the end of an extension between your thumb and forefinger. It should fall out easily. Remove excess glue from your eyelid. Once all the extensions are out, do another pass over your upper eyelashes to clear out any leftover glue. Rinse your eyelashes. Splash some warm water on your face to rinse the glue remover from your eyelashes and eye area. Most of your extensions have grown out, and you have a few left that you’d like to remove. You should be able to return to the salon and have these taken out quickly, and usually free of charge. You aren’t happy with the way you look in eyelash extensions. If you have a whole set of extensions that need to be removed, it’s much better to go back to your technician instead of trying to remove them yourself. A few days have passed since you got the extensions and you’re experiencing a pricking sensation. Sometimes one or two extensions get stuck together, or the same extension is glued to more than one natural lash. This is usually easy to resolve, but it requires a trip back to your technician. Your eyelash extensions don’t look professional. If they’re crooked, patchy, or just not attractive, go to someone you can trust to have them fixed. You don’t want to complicate the problem by accidentally damaging your natural lashes. You are experiencing a lot of pain around your eyelashes. If the glue used to apply eyelash extensions is applied improperly, it can pull at the skin and cause severe pain around the eyes. Instead of going back to the person who applied the extensions this way, put you in better hands for the removal process. If you haven’t already tried lash extensions you should at least once in your life. Choose a reputable salon, spa or eyelash extension only establishment. The lash artist should be a licensed esthetician or cosmetologist and the consultation should be free of charge. Ask what type adhesive is used and if they have a variety of lashes for customizing. Always make sure they are not applying cluster lashes as eyelash extensions one single lash applied to each one of your own. A good look eyelash extension can cost around $200 to apply. Removing the extensions is not less cheap either. It can cost the same to some salon or less according to the place you go. However, in most of the beauty shops, it is usually less. DON’T let moisture-rich products get onto your lashes. Shampoo, conditioner, heavy creams or anything oil based will eventually loosen the bond. Tilt your head back when washing your hair or take a bath to avoid getting them wet. Some of my addicted clients use swimming goggles while showering. Now you know what you’re getting into. I’ll admit, some of these tips sound a bit high-maintenance, but if you’re going to spend $200 bucks or more on your service, you want to make sure it lasts.